Making the Top 8 of a Pro Tour is pretty close to the ultimate individual accomplishment in Magic: The Gathering. Earning your first often takes years of practice, close calls, and near misses. Or sometimes you get there in your first try. It sure doesn't seem like Frank Lepore is at his first Pro Tour. He's already a well-known community member, writer, streamer, and video creator. He was just part of yet another Wizards-defeating Community Cup team. People who follow Magic regularly almost universally at least know who Frank is and, judging by the Twitch chat yesterday, want to see him succeed. And now he has, at the highest levels. Although it was a close call to even get here. 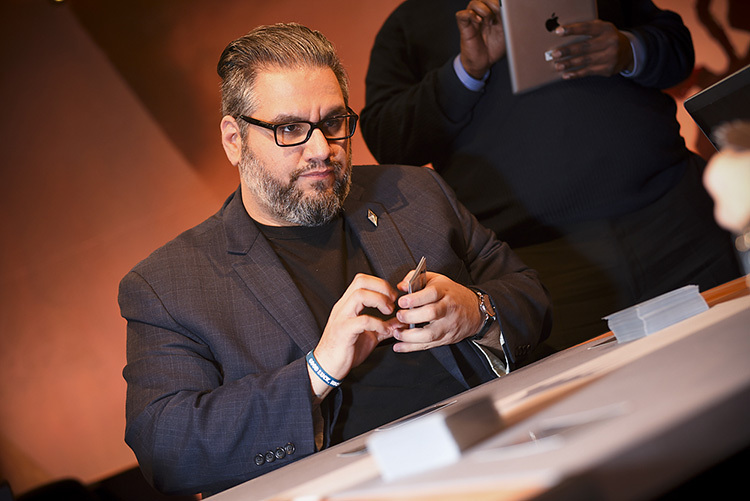 Leading the field into the early Modern rounds on Day Two, and sitting as the King of the Hill, Lepore was beset by a bad run that saw him nearly eliminated in Round 15. But owing to top seeds Shuhei Nakamura and Ivan Floch choosing to play it out in the last round, an extra spot in the Top 8 opened up. Thanks to flying high early, Lepore's tiebreakers—combined with his Round 16 victory—were enough to get him into the Top 8 on his first try. But now he has to play Floch, who very quietly crushed this tournament in Modern with the Team Face-to-Face Games and ChannelFireball Colorless Eldrazi deck that lit the world, if not on fire, some Eldrazi version of fire. Floch went 9-0-1 in Modern, his only draw coming with teammate Nakamura in Round 15 to clinch his Top 8. Lepore—also playing an Eldrazi deck, but one centered more on Processors and Spawn producers—had a bit more trouble in Constructed, thanks to that nearly disastrous late-tournament swoon. Finishing just 6-4 in Modern, Lepore leaned heavily on his 6-0 Draft performance to catapult him to the top of the Standings. 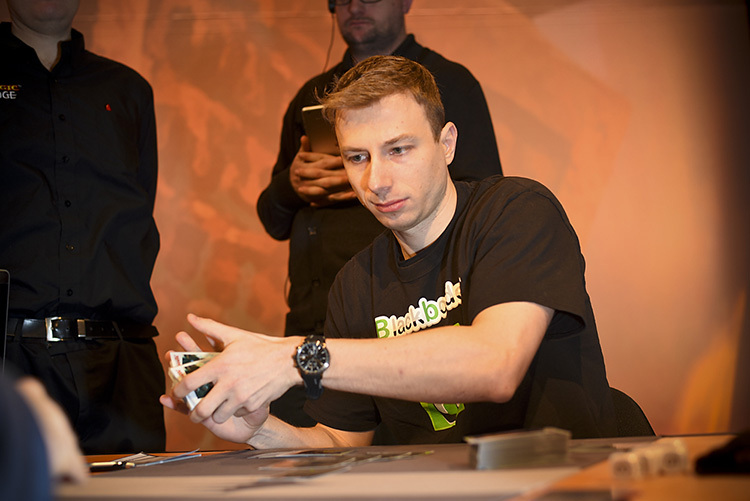 Floch also happens to be a veteran of the highest caliber, having already won a Pro Tour, a team World Championship, and a Grand Prix. Frank Lepore broke through to Sunday on his very first Pro Tour, facing down decorated Slovakian Ivan Floch in the quarterfinals. On paper, Floch looks favored. On paper, it looks like David and Goliath. But, on paper, who would have guessed Lepore would even be here? He's been bucking expectations since the weekend started. Why not now? Hitting the Eldrazi lands—Eye of Ugin and Eldrazi Temple—early is paramount in the near-mirror. It's so important, players have stated their desire to mulligan until they find at least one. It's that key to a fast start. In the first game, Lepore started with a hand containing Eye of Ugin. Floch? He went all the way to five to find an Eldrazi Temple. Unfortunately, his hand also contained Chalice of the Void, a fairly useless card in this match-up. It came down on the second turn rather ineffectively after Lepore had already played the only one-drop in his hand. Floch struck first—with a Blinkmoth Nexus. His hand was a touch slow, but so was Lepore's, as it turned out. But things heated up after that. Lepore dropped a Matter Reshaper, followed quickly by a Drowner of Hope. Floch, meanwhile, tried to race with a pair of Reality Smashers. However, the tap ability on Drowner of Hope—and then a second Drowner—kept Floch from meaningfully interacting with the flock of Eldrazi that were pouring down on him. Even a third Reality Smasher had to stay back on defense, lest they fall prey to the Intro Pack rares staring down at them. To add insult to injury, Floch had drawn his two Wastes, so when Lepore Ghost Quartered him, it was effectively Strip Mine. It didn't take much more to convince Floch that his chances had flown the coup. The second game started much like the first for Floch, spotting a hand with no Eldrazi lands and no good early plays, while Lepore got to keep a semi-speculative hand that nonetheless held an Eye of Ugin, but no sources of colorless mana. Floch halted his mulligan slide at six, holding multiple copies of his key lands and enough action to get him started. Lepore was familiar with the Eldrazi mirrors at this point, poised and ready to execute his game plan. Lepore struck first again, with a turn one Eldrazi Mimic, but it was Floch who struck back harder, using Thought-Knot Seer to strip Lepore's copy of the same card. He then followed up by using Ghost Quarter to strip away Lepore's key Eye of Ugin. It was a sequence that set Lepore back significantly, virtually locking him out of the arms race. Floch then went into overdrive, Oblivion Sower snatched a land that let him play Matter Reshaper on the same turn. Unable to keep up with Floch's mana base to summon his own monstrous Eldrazi, Lepore could take no more. So on to the third game the players flew, and once again it poured mulligans. This time, both players couldn't keep their opening hands, and Lepore mused over his second hand for quite some time before moving on with the match. "This deck certainly likes to mulligan, that's for sure," Lepore said. As had become customary, lands were the early focus of the game, as Lepore led with Eye of Ugin, but lost it to Floch's first turn Ghost Quarter. And then Lepore missed his next land drop. And his next. A Relic of Progenitus draw did nothing to help. Floch, meanwhile, was flush with lands. He led with a Matter Reshaper that was met by one from Lepore once he finally hit lands. They traded and both dumped lands on the board, as Floch nodded to Lepore's Eldrazi Temple, acknowledging the fortunate hit. But Floch didn't know the half of it. When Floch played a Thought-Knot Seer, he saw why Lepore had kept the hand. A trio of Reality Smashers waited for Lepore to hit five mana and come pouring down on Floch. And hit five mana he did, despite his early mana problems. Smasher was one of the best cards in this matchup, and Floch was now facing the prospect of three of them. 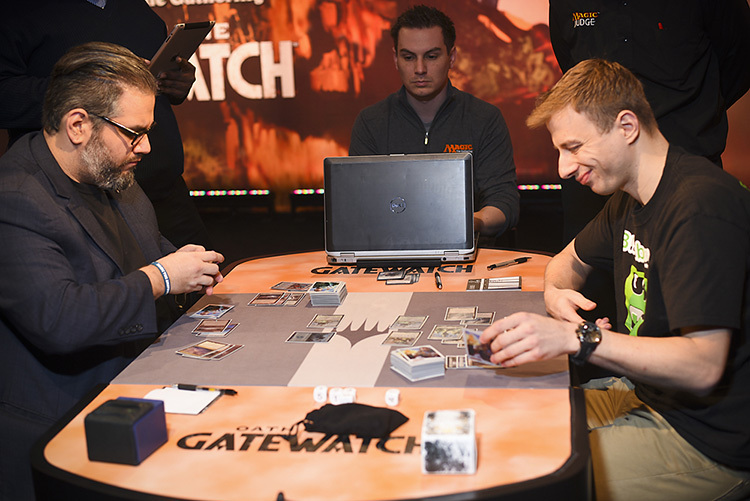 Floch's recent years on the Pro Tour have been outstanding, with Pro Tour Oath of the Gatewatch being his third Top 8. But instead, Lepore ripped a Blight Herder, and brought along with it three Eldrazi Scions, making attacking a far, far more difficult prospect for Floch. Floch, in turn, answered with Oblivion Sower, looking to gum the board and overflow his mana. Eye of Ugin and Ghost Quarter helped, and suddenly the board looked pretty cluttered. A second Oblivion Sower merely stacked the sides up even further. Slowly, the board was gummed up and bogged down on the ground. There was little room to maneuver. So Floch took flight, firing up his trio of Blinkmoth Nexus to get in what damage he could. It was just a little damage coming from the big Eldrazi decks, but it was pushing the clock. Lepore couldn't find a way to un-gum the board, and soon succumbed to a flock of flying nexuses. In the fourth game, both players were finally able to keep their opening hands, meaning we were in for some hot, hot Eldrazi-on-Eldrazi action. The first Eldrazi, from Lepore, was a Matter Reshaper. The second, a 4/4 Endless One from Floch. The third, a Reality Smasher from Lepore. Floch had kept a strong hand, but it wasn't actually able to produce colorless mana. He had Eye of Ugin—good, great even—and Urborg, Tomb of Yawgmoth. A second Eye in hand did him little good. But that was it. Dismember let him keep pace, but things looked grim when Wasteland Strangler let Lepore clear Floch's board. Until Lepore Ghost Quartered Eye of Ugin. Suddenly, Floch could fetch Wastes, play his backup Eye of Ugin, and start casting spells again. And Frank knew it, wincing a bit when Floch laid the legendary land. Another Ghost Quarter took out the second copy of Eye of Ugin, but the damage was done. Floch went from being unable to cast anything to being able to attack freely with his Thought-Knot Seer. Lepore was running on empty. Floch had gas for days, but not the means to utilize it all. It would be a matter of who could draw out of it first and most effectively. On paper, Floch looked favored. But when you drew up the cards? Lepore drew a Blight Herder followed by a Reality Smasher, and with Floch's life total already low, we were headed to a fifth and final game. Thus far, the match had been back and forth, with each player trading blows, games, and, of course, Eldrazi. Beyond the lopsided first game, these two had struggled mightily for every inch of every Eldrazi. That was not the case for the fifth game. Lepore missed on lands, while Floch was hitting on all strides. An Eldrazi Mimic and two Thought-Knot Seers—plus a few more missed land drops for Lepore—and Floch was on to the semifinals. On paper, Floch was advantaged. On paper, Floch won. But anyone who watched the match knows—Lepore gave him a run for his money. Not a bad first Pro Tour. Ivan Floch defeats Frank Lepore 3-2 and advances to the semifinals!